The PSG star is set for a lengthy spell on the sidelines after suffering a foot injury against Strasbourg. PSG forward Neymar also missed last year's meetings with Real Madrid. PSG HAVE CONFIRMED that Neymar will miss both legs of their Champions League last-16 tie against Manchester United through injury. Following the review from renowned medical experts, Neymar has been ruled out of action for ten weeks, which will see him miss a crucial run of fixtures for the French champions. The mercurial winger will play no part in PSG’s trip to Old Trafford on 12 February, nor will he be available to play in the return leg at Parc Des Princes on 3 March. The 26-year-old has scored 19 goals in 21 appearances across all competitions this season, helping PSG storm clear at the top of Ligue 1. 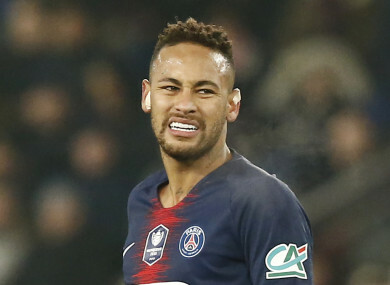 Neymar will now miss a number of crucial domestic games additionally, including the trip to Lyon this Saturday and another away clash against Saint Ettiene on February 17. Fortunately, PSG are already overwhelming favourites to retain their Ligue 1 crown, having established a 13 point lead at the top of the table ahead of Lille. Depending on how Neymar’s recovery goes, he might also have to sit out the Champions League quarter-finals if PSG get past Man United, with his expected return date not yet known for certain. Email “Neymar ruled out for 10 weeks with Brazilian to miss Man United Champions League tie”. Feedback on “Neymar ruled out for 10 weeks with Brazilian to miss Man United Champions League tie”.